Cut costs and reduce emissions with an electric vehicle. ELECTRIC VEHICLES (EVs) are becoming more and more popular in Ireland. Driving an electric car will help you cut running costs and reduce emissions and you can avail of VRT relief for electric vehicles and grants are available through the Sustainable Energy Authority of Ireland to help towards the purchase of a new EV. We’ve rounded up five electric cars available to buy on DoneDeal, from the dream car to the (slightly more) affordable. This BMW i3 94Ah has an impressive claimed one-charge range of 314km (although the real-world figure is more like 200km). The i3 comes with a comprehensive equipment list and a feeling of quality unequalled in the sector. The Volkswagen e-Golf has a claimed range of 300km, but again the ‘real-world’ figure is more like 200km of driving range per charge. 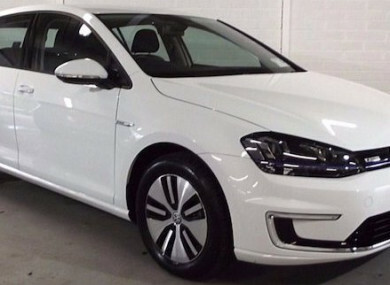 The e-Golf also has the ability to fast charge, which can replenish up to 80 per cent of the battery’s charge in as little as 45 minutes. The new Nissan Leaf Nissan Leaf 40kWh has a one-charge range of 270km on the WLTP cycle, which is closer to what is considered real-world driving than the old NEDC test procedure. With a DC fast charge, the Leaf can get to 80 per cent capacity in 40-60 minutes. Using a standard 7.2kW public charger or home wall box, it takes approximately 7.5 hours to fully charge the car. The Renault Zoe R90 Z.E. 40 Dynamique Nav has a claimed one-charge range of 403km. However, the real-world figure is more like 280km putting it roughly on par with the Nissan Leaf. The Zoe’s battery can be charged to 80 per cent capacity in 1 hour 40 minutes with a 43kW public charge point. According to Nissan’s NEDC test, the electric range is 199km for the 24kWh Leaf. The 24kW Leaf can be fully charged in 3.5 hours using a fast charger or using a regular wall socket it will take 10.5 hours to charge. This particular model comes with a 6kW charger. Email “5 of the slickest electric cars for a range of budgets”. Feedback on “5 of the slickest electric cars for a range of budgets”.